From his roster of celebrity clients to his reality television series, Cesar Millan is America's most sought-after dog behavior expert. Now, he reveals the amazing ways that our pets can teach us. In this affecting book, he shares eight heartwarming stories about the dogs that have inspired him the most—and the lessons he's learned from them about healing and more. Each chapter, drawing on celebrity and noncelebrity clients alike, spotlights the essential traits that allow these animals to make the best of their situations—from authenticity to acceptance—and reveals how we can embrace these values to enrich our own lives. 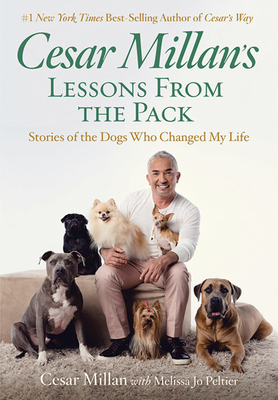 Sharing never-before-told insights, Cesar imparts a unique blueprint for seeking happiness and fulfillment through canine companionship. CESAR MILLAN is a public speaker and the internationally acclaimed star of Cesar 911, as well as the original, Emmy-nominated host of the Dog Whisperer program. With Cesar 911, he brings more than 25 years of dog experience and his status as the most recognized and sought-after authority in the field of dog care and rehabilitation directly to communities terrorized by unruly hounds. In addition to co-authoring six books, Cesar has created numerous instructional DVDs and continues to host a popular series of seminars where attendees learn how to apply his extensive knowledge of dog psychology and rehabilitation techniques. MELISSA JO PELTIER was co-executive producer of the Emmy-nominated National Geographic Channel series, Dog Whisperer with Cesar Millan, as well as Cesar Millan's co-author for five previous New York Times Bestsellers and three other non-fiction titles. She is an Emmy-winning veteran television and film writer, director and producer with over 50 national and international awards to her name. Her first novel about the entertainment business, Reality Boulevard, was named by Kirkus Reviews as one of its "Best Indies of 2013." Peltier lives in New York with her husband and their rescue pit mix, Frannie.